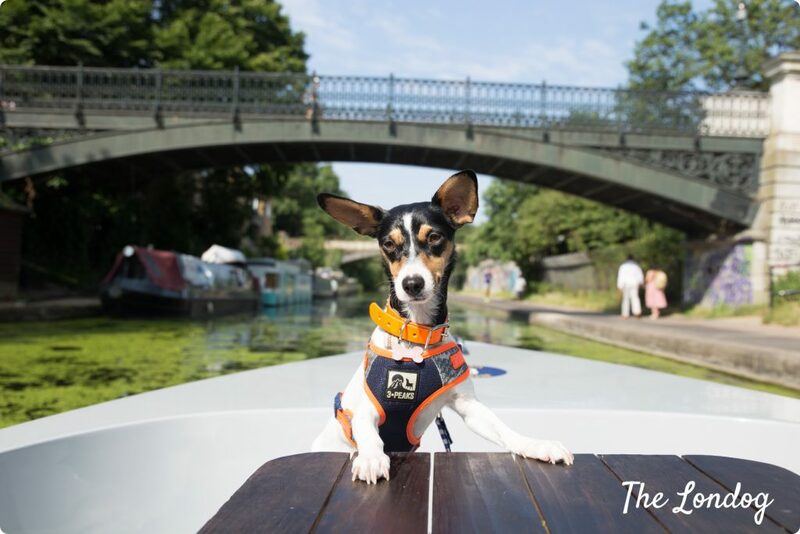 Last month we told you about the dog-friendly rowing boats at Hollow Ponds. 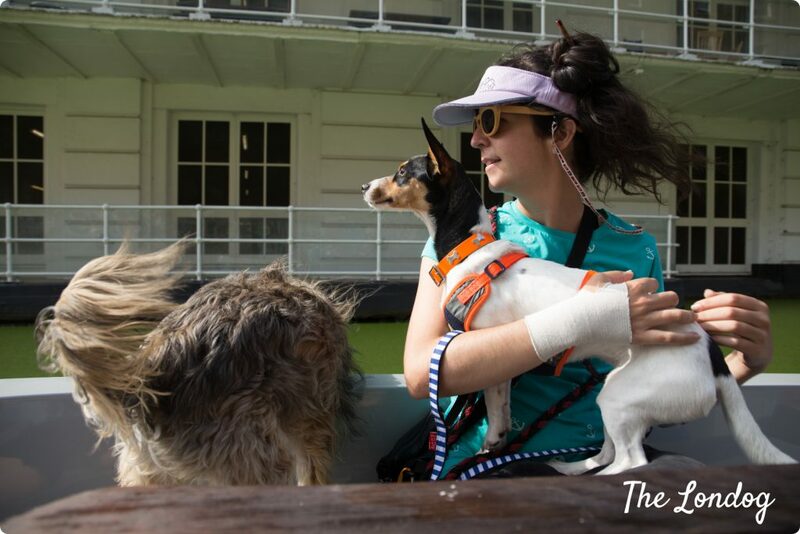 Today we add one more water-based experience for your dog-friendly adventures inspiration list, that we were invited to try. 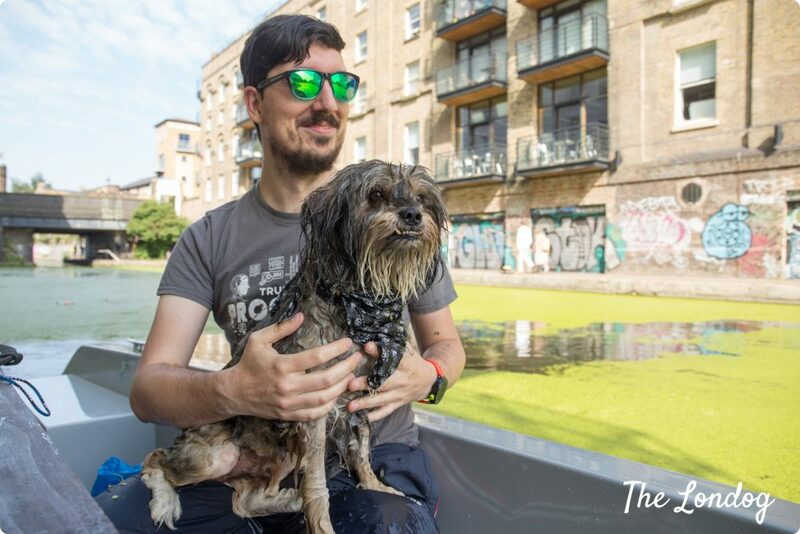 This time, it is one far more relaxing than rowing: hiring a dog-friendly electric boat and going for an adventure on the Regent’s Canal! I have always loved the Regent’s Canal as a destination for a stroll. 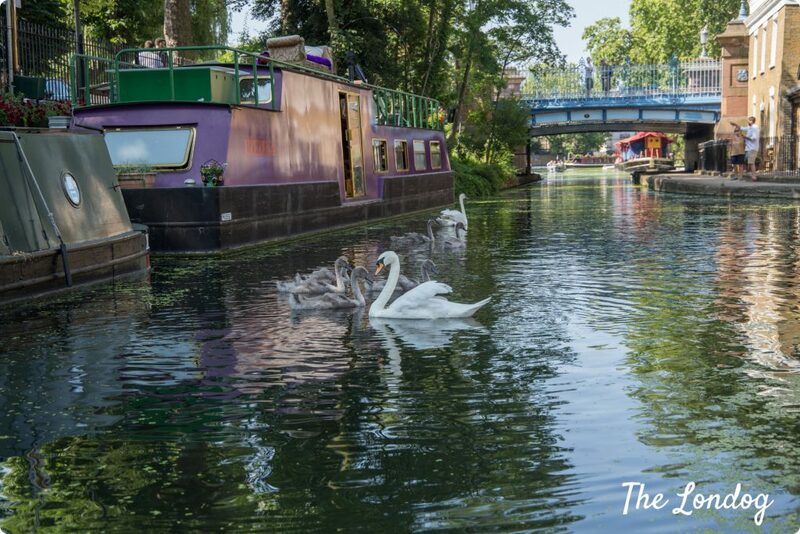 You feel miles away from the traffic, in a quieter place Where you can admire the landscape changing along the canal. 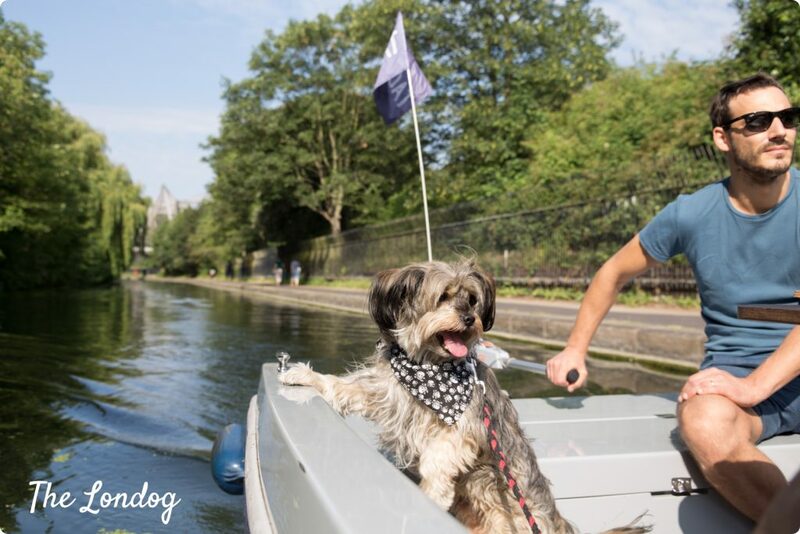 You may not be able to take dogs on the London Waterbus (as their website warns; which runs between Little Venice, the London Zoo and Camden Lock), but there is an even better alternative to enjoy the Regent’s Canal from the water with your dog… As captain of your GoBoat London dog-friendly electric boat! 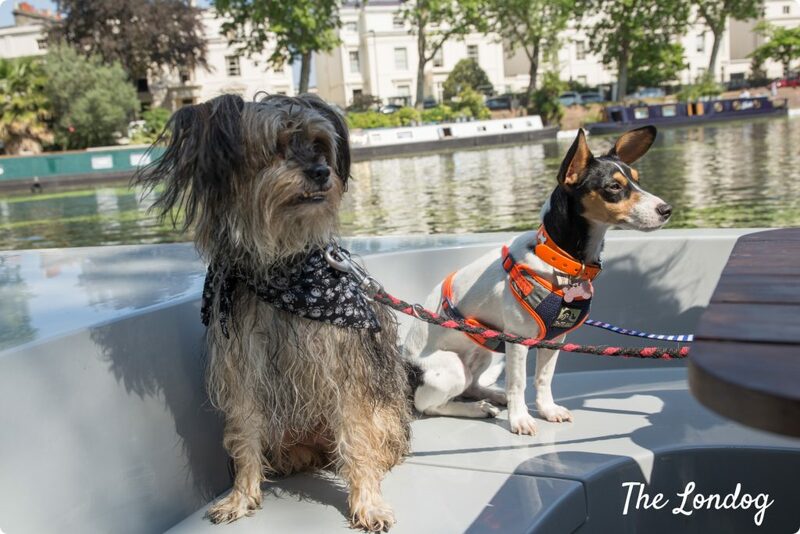 GoBoat’s electric boats are for hire and allow you to take along a crew of up to 8 bodies (counting yourself and any dogs you may want to bring), while no previous sailing experience is required. In fact, during our boat trip (about which I will tell you below), we encountered another of GoBoat’s boats with a lovely Labrador cross on board! 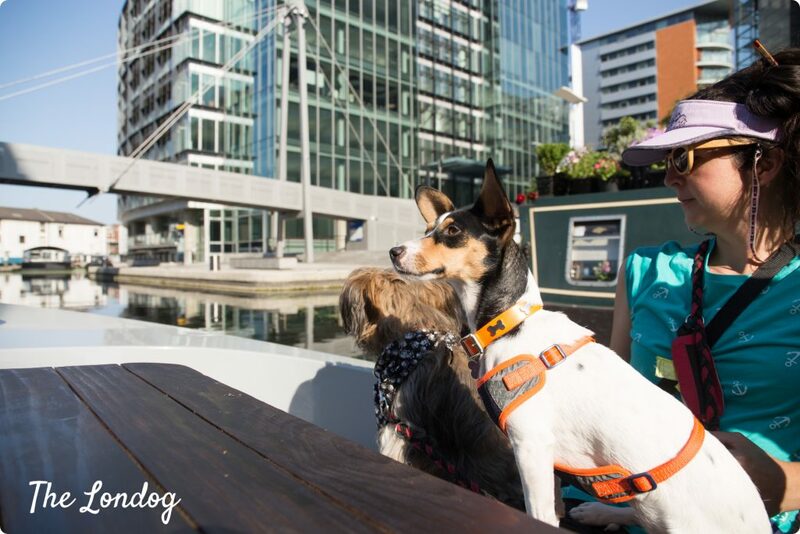 For dog owners wishing to bring their hound, GoBoat London recommends at least one handler per dog “just to keep things safe on board for everybody”. We had been invited to try GoBoat London’s boats. The day we had penciled in for the boat trip was blessed with a glorious sunshine and amazing Summer temperatures. 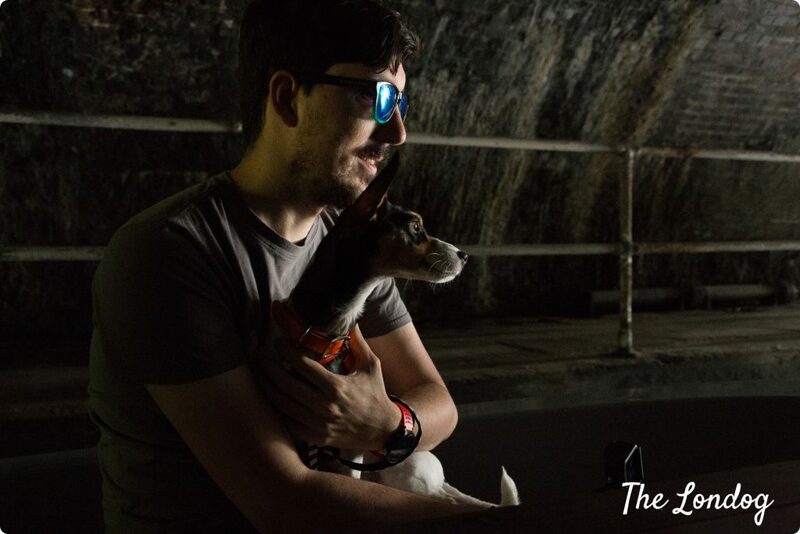 For the occasion, we had invited lovely rescue mutts Gustavito (@gustaveli on Facebook and @souviron on Instagram) and Glitch and their owners, Maria and Vincent, for the sail (who made a lovely video of the adventure, which you can view at the bottom of this post). 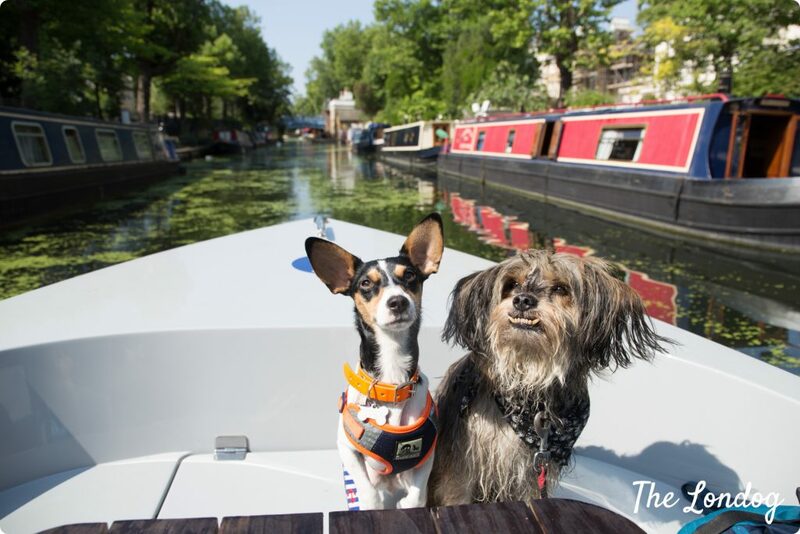 Two dogs in a boat (to say nothing about the humans)! We arrived at GoBoat London’s mooring a bit earlier than recommended (they tell that you must be there 15 minutes before the time for the safety brief) and the staff guided us to our boat. Gustavito and Glitch were lifted to get on board (although upon return Gus was able to jump off the boat on the dock without any help). A larger dog could probably easily jump in, provided that he/she is not scared of the boat. Once on the boat we were given the safety brief, as well as an explanation about how to drive and the navigation rules on the canal (including where to keep the right, the left, where to use caution, etc.) with the help of a map. I didn’t know that we would drive on the right hand-side for most of the time, the European way! We were soon ready to go, with a lovely human and canine crew of 6! And being our time slot the first in the morning, we were able to avoid the heat while getting the best of the morning. 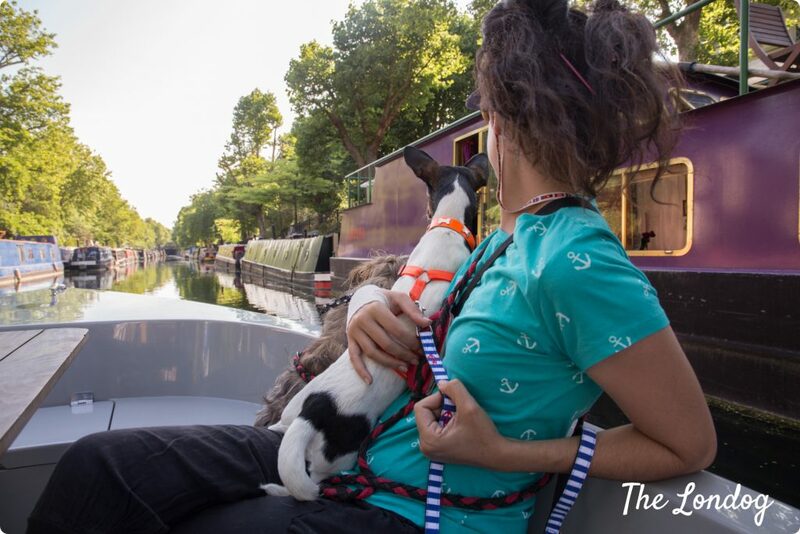 As soon as we got moving, it was clear that Gustavito and Glitch would have thoroughly enjoyed the experience, busy watching either the canal’s path or over the bow to see where we were heading. Gus, for the occasion, wore a pirates bandana and his fluffy ears were combed by the delicate breeze from the movement of the boat. Glitch, with her maritime leash, was also dressed up in theme. We left at 8.45am, navigating Little Venice in the incredible colours of the morning. The house-boats moored on the sides of the canal, a carpet of green duckweeds, and the gentle sun rays gave us a triumph of colours and a comfortable temperature to enjoy. 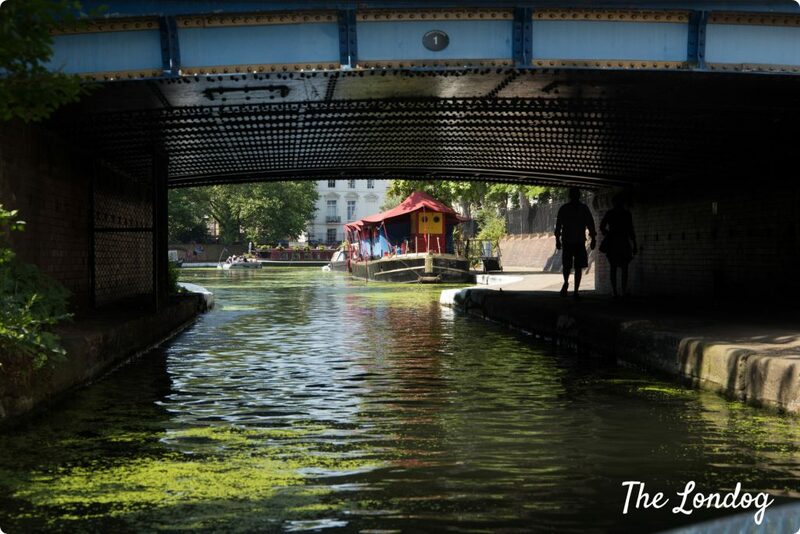 Once we arrived at the round-about, we turned towards the Eastbound section of the canal (we were told that the other section was closed and we anyway loved the idea of reaching Camden Lock). From there we could admire house boats, lovely houses and villas and weeping willows caressing the boat, until we got in front of the London Zoo. Personally, I am not a fan of zoos at all, but if you are, from the boat you can see the big aviary and some of the cages, including those of the African Wild Dogs (one of whom made a very brief appearence while we were passing by). As soon as we approached the zoo, Glitch started lifting her nose to smell the air with interest. On our way out we also encountered some wildlife such as swans and other birds, swimming with their chicks. The Regent’s Canal, on a Sunday morning at 9am, appeared very quiet and we didn’t encounter any boats in navigation, which made the sail easy and fast: we didn’t have to wait or give way for crossing the narrower parts of the canal or entering the tunnels. In less than an hour we reached Camden Lock. Once we got there and we were commenting how fast and smooth the travel until there had been, suddenly, to add some thrill to the experience, Gustavito decided to jump off the boat into the water (Glitch had earlier attemped a jump, but was grabbed by her harness before it was too late). This threw us in a moment of panic. A debate started over whether anyone should dive and rescue him, but we convened to gently stir the boat and try and catch him from the side. However, Gus didn’t like the idea of coming near the boat and started to swim away, maybe to head to the bank instead. Luckily we managed to intercept and grab him, getting him back on board! What an adventure! You should have seen his mortified face when he sat – completely soaked – on Vincent’s lap. We assumed that he must have thought that the bright green weed on the surface was grass! Once he was safe, we laughed about it and almost regret that nobody filmed the scene of the rescue! We also realised that, apart from life jackets, we had a rescue rope and a horn under the seat. FYI, just in case you need to improvise a rescue mission. Our way back was smooth and lovely. The canal started to be a bit more congested, so we had to give way in a couple of points, so it took us a bit longer, but the boat was easy to drive. Gus enjoyed the ride and started to dry a bit. Maria later told me that, when they arrived at home he was then completely dry, didn’t smell too badly and his fur was very soft! In two hours we had managed to reach Camden Lock and come back, and still had a few minutes left, so we had a couple of spins in the round-about to have a last gaze of Little Venice from the water. However, for your trip consider that if the canal is busy it can take far more time to navigate and pass the one-boat-at-a-time tunnels (during weekends GoBoat in fact recommends allowing 3 hours for our same trip, to tackle heavier boat traffic). If it is a warm Summer day pick a suitable time to avoid overheating (during our early morning trip, we found that for long parts of the navigation one could enjoy shade). 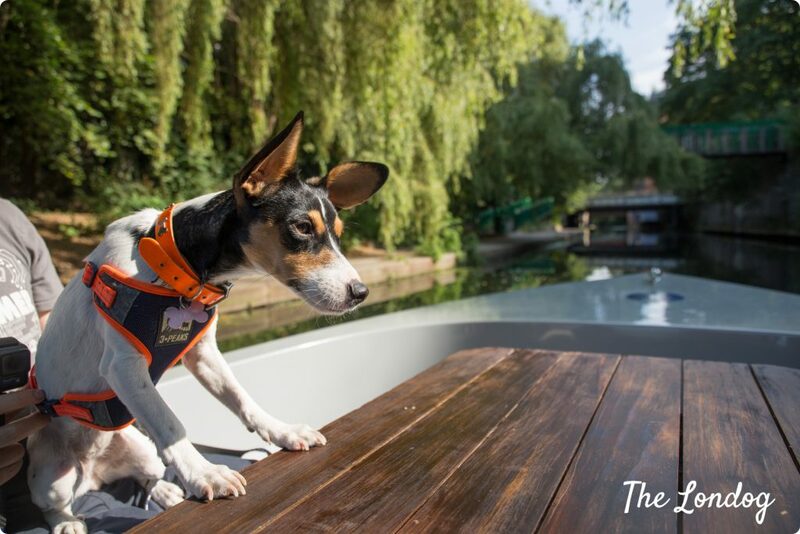 Make your dog wear a harness with a handle (or a floating coat), just in case you need to pick him/her up in the event of a jump in the canal. Bring a towel (again just in case No. 2 happens). As noted by Maria, also make sure to bring treats or something to chew on for your dog. This will help if your dog gets nervous or bored. 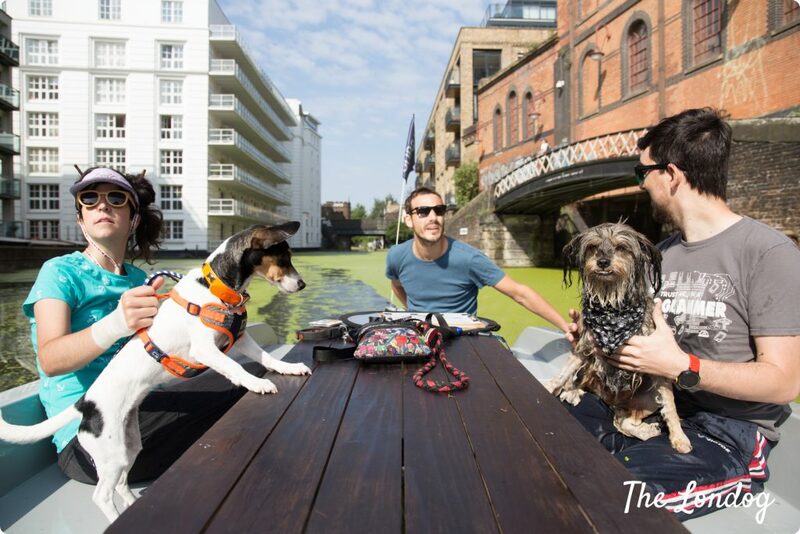 GoBoat London’s base is located on the canal in Merchant Square, near Paddington. You can easily walk there either from Edwage Road or Paddington tube stations. Prices. 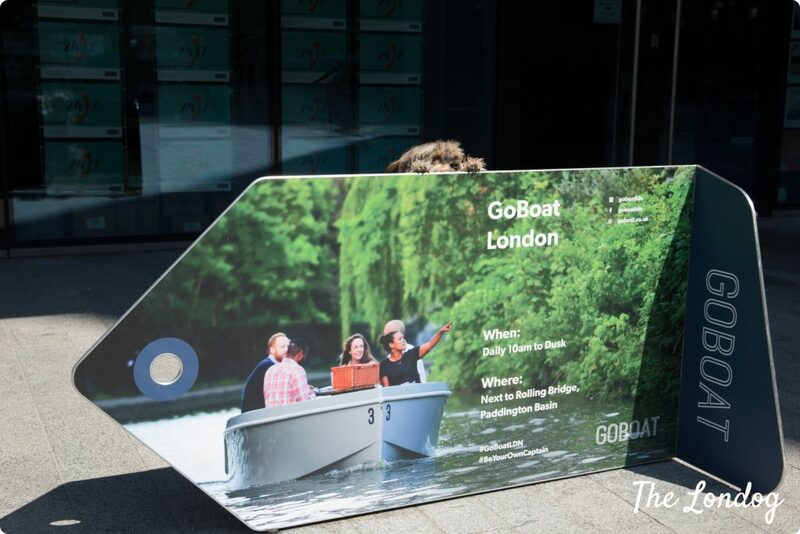 GoBoat London boats tariffs are per hour per boat and depend on whether you pick an off-peak day (Monday to Friday), or you hire them over the weekend or bank holidays. For one hour it is £59 off-peak and £79 peak, while 2 hours come at £89 off-peak and £109 peak, and so on (you can find all prices here). Gus’ (and Glitch) mum, Maria, was so kind to share a video she made of the adventure. You can view it below (make sure to follow also his YouTube channel here). 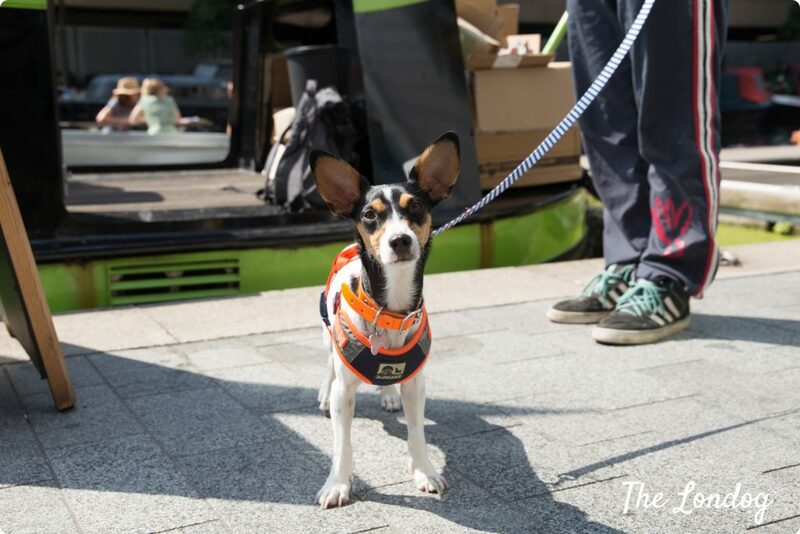 Stay tuned for more dog-friendly adventures!